This summer I read Tod Bolsinger’s book “Canoeing the Mountains” about the famous Lewis & Clark expedition. The goal was to find the elusive NorthWest Passage that would enable factories and cities in the east and midwest to ship things by boat to the Pacific Ocean, just as the Mississippi made it possible to get to the Atlantic Ocean. People had already discovered that the United States is not flat. It slopes up gently from the east coast to the continental divide, so plenty of rivers travel east. The assumption was that on the other side of the continental divide, the rivers would flow west to the Pacific. They expected that they could canoe up to the head of the Missouri River, walk over the continental divide, and drop their canoes back into the Columbia or Colorado Rivers, which they’d heard about from ships in the Pacific. So they put together a band of expert river-runners led by Lewis and Clark, and after several years they finally arrived at the end of the Missouri river, further west than any white people had ever travelled before. What they hadn’t realized, however, is that the between the Missouri and Columbia Rivers are the Rocky Mountains! They’d heard from the natives that there were mountains to cross, but they imagined the 2000-4000 footers we have in New England, not the 12,000 footers of Montana & Idaho! Instead of a gentle hill, in front of them was an impassable wall of mountains. They travelled north and south looking for an opening, but there wasn't one. They’d never be able to drag their canoes over those steep, snowy peaks! At that point they had a choice to make. Either they could give up their mission, return home and declare that the dreamed-of NorthWest Passage just doesn’t exist, or they could leave their canoes behind and learn to mountain climb. Realize what a challenge that must have been. These people are experts on rivers: it’s what they’ve been doing all their lives. It’s why they’d been chosen for this mission! But now they had to choose between learning something completely new in order to face challenge in front of them, or turning back to stick with what was comfortable. They debated for several weeks, but finally decided to stop for a year to learn from the local native tribes how to climb mountains and survive at high altitudes so that they could keep moving west all the way to the Pacific, as they’d been commissioned to do by the president. All the expertise they were famous for wasn’t going to help any more. Some of the tools they’d brought wouldn’t be useful anymore. They couldn’t bring their canoes so if they got to the other side and found the rivers they were looking for, they’d have to cut down trees and build new canoes. And this may be the perfect metaphor for what the Church in America is facing today. For centuries, the church has thrived in America. We’ve learned how to start congregations, reach neighbors, raise money, influence culture, control politicians and catechize our kids. We’ve developed our own styles of church building architecture, and traditions that we love, like worship with organs and bell choirs, or candles on Christmas Eve. We’ve become experts at being Christians in a Christian culture. But we don’t live in a Christian culture anymore. It used to be that everyone went to church on Sunday. Stores were all closed on Sundays and no Little league would ever schedule a game. Not today. Pastors aren’t admired anymore, we’re assumed to be pedophiles. Christians aren’t respected in society, we’re accused of being bigots and backward. The culture is no longer shaped by Christian values or worldviews, so our old ways of explaining or doing things just don’t communicate like they used to. Some Christians have tried to ignore these changes. Just keep canoeing: we’re the best in the world at it. We’ve been doing it for centuries, so just keep canoeing like we always have, until all the people come back. Other Christians have just given up. If canoeing doesn’t work anymore, then Christianity has failed. It’s no longer relevant; why bother trying? But there’s a new generation of churches, including Highrock, that are trying something new. We’ve been learning to climb mountains. Sometimes we get criticized by other Christians that we’re not canoeing the right way, but we’re not trying to canoe anymore, because we’re no longer in the river. Pretty regularly, discouraged leaders from declining churches ask me why we are growing so much, and I explain that it’s not that we’re doing what they’re doing, just better. No, they’re better at what they do than we could ever hope to be. We’re doing something different. We’re thinking about preaching and small groups and discipleship, community, and ministry in very different ways than traditional churches have. We’re questioning our power structures, and how to combat the creep of institutionalism that previous churches were trying to cultivate. We still have the same mission — just like Lewis & Clark never changed their mission — they just had to change their approach. Likewise, we’re continuing the mission by doing things differently than the way you might have in a previous church. You might like that way of doing it better, and I don’t blame you. I’m sure that Lewis & Clark liked canoeing better than climbing, but they had to choose between what was familiar and what would enable them to be faithful. Likewise, we don’t have the luxury of taking with us all the things that we’ve enjoyed from the past. If we’re going remain faithful to follow Jesus in this new culture, we’ll need to figure out what we need to bring with us, and what we need to leave behind. And like Lewis & Clark, we’re going to learn some new things. And I’m telling you this because it’s not just churches that need to change to flourish in this new culture, Christians do too. The mantra of our age is that we want to “make a difference”. I love that! But if we’ve been doing the same things for centuries, and it’s not working, then we need to do something different, become something different before we can make any difference. It’s not enough anymore to simply be nice people, swear slightly less than your coworkers, and invite people to church. That won’t work in this culture. People aren’t interested in that anymore. They want to see something different from the superficial self-centeredness of our culture. They want to see something deeper. Something truer. Something more beautiful. They want to see Jesus in this mess. So people who are filled with the Holy Spirit of Jesus can offer that, but only if we don't settle for what we’re used to, or what everyone one else in our society does. We need to be different if we’re going to make a difference. That's our focus this year at Highrock: not becoming different from our neighbors, as if we’re somehow superior, but becoming different for our neighbors, so that we can be servants. That is why I get so excited about our Launch Day gatherings every year. Volunteers are the leaders of the church: you are the servants I’m talking about. And I know that many of you are here at Highrock because even though you knew how to canoe and were very comfortable there, you chose to learn mountain climbing so that you could reach others. Others of you were born in the mountains and don’t know what canoeing is. You’re thinking “Handbells? Was that really a thing?” Yes — it was a thing. There is a lot you can learn from the people who have been journeying a long time already, but you are the natives who can teach us about the mountains, and lead us in our next steps. Whichever group you are a part of, thank you! You are a valuable part of this; none of this would be possible without you. In short, our vision is Transformation through Connecting with God Personally, with God's People, and with God's Purposes. Folks — none of this has changed. Our vision and our values stay the same, but if we’re going to make a difference, we need to be different. Why try so hard and sacrifice so much to keep up with your neighbors if your neighbors are going in the wrong direction? We’re not trying to fit in: we’re trying to be different. Not simply different from others, but different for them. So this year we want to call one another to making costly choices to Connect with God Personally, with God’s People and with God’s Purposes. Connecting with God Personally means find ways to cultivate your devotional life with God. No relationship can thrive without time and attention, including our relationship with God. In addition to Sunday worship, this may include quiet times, devotionals, reading through the Bible this year, studying with other Christians, or a particular pattern of prayer. We’re not saying there’s only one way to do it, but in whatever way fits the personality God gave you, you have to do it. Given how busy all of us are, this will require a costly choice. But you cannot grow and flourish, no matter how much ministry you do, or how much you want to, if you don’t deliberately make space to be with God. This means taking our relationships seriously, with each other and with outsiders. You know, today most people are commitment-phobes; we don’t want to tie ourselves down in case a better opportunity comes by. But what that means is that we’re also intimacy-phobes and effectiveness-phobes, which probably isn’t what we intended. We believe that relationships can have spiritual power if we approach them as spiritual people. How can we change the way we relate to others so that we might experience God working in our relationships more frequently? We want to connect to God’s Purposes using our gifts, talents, time, treasures, personalities, and opportunities to join God in blessing others. You can’t fix everything, but you can do something! And like the little boy bringing his loaves and fishes that fed thousands, Jesus can take whatever we offer Him and do something miraculous through it. Using the BLESS paradigm from our sermon series last spring, we’re going to challenge each other to choose 3 specific people, including at least one non-Christian and one Christian, and deliberately bless them by Beginning with Prayer, Listening, Eating together, Serving, and Sharing stories. 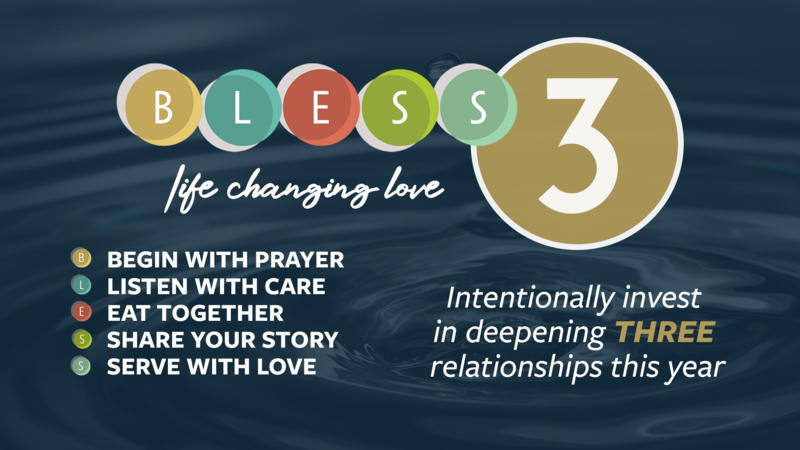 It’s not that 3 is all you need, but the goal is to train ourselves in this new way of relating so that eventually all our relationships become more spiritually rich. My hope is that when Small Groups gather, Youth Group kids get together, a family sits down to dinner, or two Highrockers meet for coffee, along the way someone will ask “so who are your 3, and how’s it going?” That way we can learn from each other, encourage each other, and truly become different. 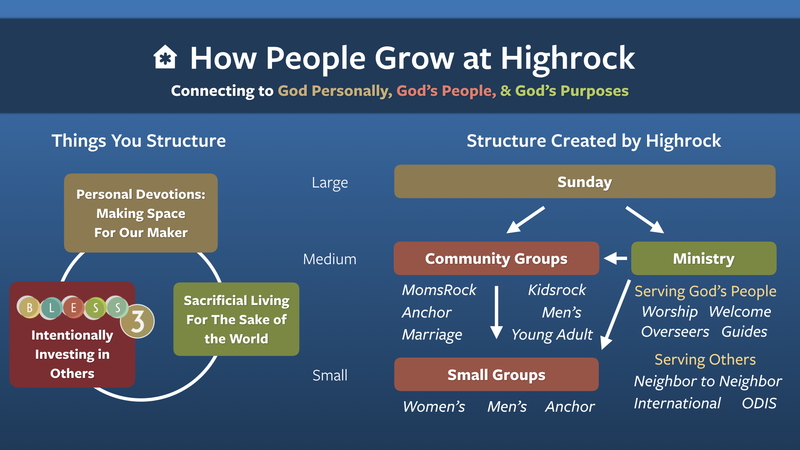 There’s a lot more — too much to cover in one blog post — but let me close with this summary about how people grow at Highrock. It doesn’t matter what great programs our church may come up with: if you don’t find a way to integrate each of these in your own life, you will not grow. If you want to really be different this time next year than you are today, then we encourage you to commit to one thing from each of those categories. Sunday worship is something for all of us to do weekly, and beyond that commitment, find a Community Group and a Ministry of some kind. Our experience confirms that you need all 3 of these in order to have a balanced spiritual diet and grow up in Christ. If you either spend all your time in groups being served or all your time serving, you’ll miss something essential. Friends — we’re living in a very different America than the one from 30 years ago, so we need to be different. We need to do different things if we’re going to make a difference. This year we want to help you do that. Like Lewis & Clark discovered, it may require you to give up some things that are comfortable and commit to some things that are hard. But we’ve learned a few things over the years about how to mountain climb, and while it is hard sometimes, it turns out to be really fun! If we keep following Jesus, no matter where He leads us, or what we encounter along the way, He’ll lead us to victory.